I know I keep talking about how exhausted I've become over the past couple of weeks - and I am - but in all honesty, I refuse to let it slow me down! Yes, I am listening to my body, elevating my feet and going to bed early. But I will not spend my last few weeks with just Bryan sitting on my couch. Nope. Not gonna happen. It's just not me to let life pass me by, therefore we headed out on the lake for a fun day with some of our friends! I have totally embraced my body since being pregnant and it was nice to be in a bathing suit and not feel self conscience for once.. being pregnant is just so freeing! We are sopping wet thanks to the rain that came in outta no where and were forced to call our Sunday Funday short. 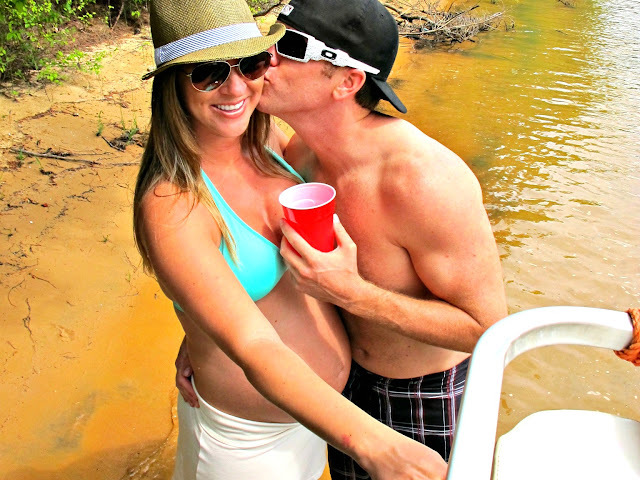 Next time we're out on the lake, we'll have our little guy in tow... Oh how I cannot wait! Oh the lake looks so fun! Thank goodness summer is almost here! Your baby bump looks adorable! It's getting so close! You look fantastic!!! And your bump is sooo tanned!!! Lol!!! Can't believe he's gunna be here soon!! ps. where did you get your hat? I love it. So. Much. Fun. Even the rain was fun. now I just need to get as tan as you. You are looking great! I can't wait to see the little man on the boat...he will love it!! LOVE that you wore a bikini. I wore one when I was pregnant and never felt more confident! You look great!! Good for you for rocking a bikini this weekend. I'm not slowing down at all either- I'm trying to fit as much as I can in while I still feel good. How are you so tan?? Jealous! You look GREAT! I could have never pulled off the bikini while pregnant. I thought I was going too once the belly got big and Brad freaked out and said.. go change!! LOL!! How many more weeks?! Good for you for enjoying yourself while pregnant! the lake looks amazing, makes me so excited for summertime. you are so adorable pregnant. good for you for enjoying yourself while pregnant! the lake looks amazing and makes me so excited for summertime. you look so amazing pregnant! Boat days are my favorite! Sure to be a future favorite of your sweet little boy as well. And you are one hot mamma to boot!! ROCK THAT BIKINI GIRL! you look fantastic! I wore a bikini this weekend as well because pregnancy should be embraced and not hidden! great pics! You look GREAT! One hot mama! You look great! So glad even though you are tired you are making some last memories as just a couple! I never understood how much I would love my body until I was pregnant and had a baby. Now I have 2, and while I'm far from looking like I used to pre-baby, I am so much more forgiving on myself because the whole process is amazing- look what we can do! You look awesome! Enjoy these last weeks with the bump... you do miss it once it's gone (although having a baby is sooo much better)!